Oak Creek, Wisconsin-November 13, 2018- AW-LAKE COMPANY introduces the FAC-S™ Analog Output Sensor that hardwires with any flow meter to provide voltage, current or Bluetooth connectivity of readings. Ideal for use on any AW-Lake Gear or Turbine Flow Meter, the FAC-S produces a scalable voltage or current output for download to a PLC or other control system. The sensor also supports a Bluetooth interface for remote programming and flow monitoring from a smart phone. The microprocessor-based FAC-S Sensor supports process monitoring, data acquisition and signal conditioning in various industries. A Bluetooth-enabled mobile app connects to the FAC-S, enabling wireless setup and troubleshooting from a mobile device. Workers no longer need to walk to/from the device to monitor or adjust equipment. Instead, initial setup and programming tasks is performed from the convenience of a smart phone or tablet. The mobile application also supports basic scaling and advanced functions, allowing for remote correction of non-linear flow meters to keep a linear analog output. Using the Bluetooth mobile application, users have a wireless flow monitor in their hands! The FAC-S Analog Output Sensor features a large input range from 0.25Hz to 5,000 Hz with five user-selectable outputs including 4-20mA, 0-5V, 1-5V, 0-10V, and 2-10V. It joins the FAC-R, a remote version that interfaces with flow meters, tachometers, pumps, motors and linear/rotational encoders. 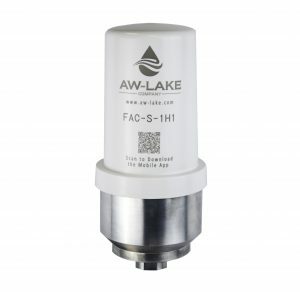 For more information on the FAC-S Analog Output Sensor, refer to the website at https://aw-lake.com/product/fac-s-analog-output-sensor-with-bluetooth/ or contact Marcia Reiff, Marketing Manager, at 800-850-6110, e-mail mreiff@aw-lake.com.